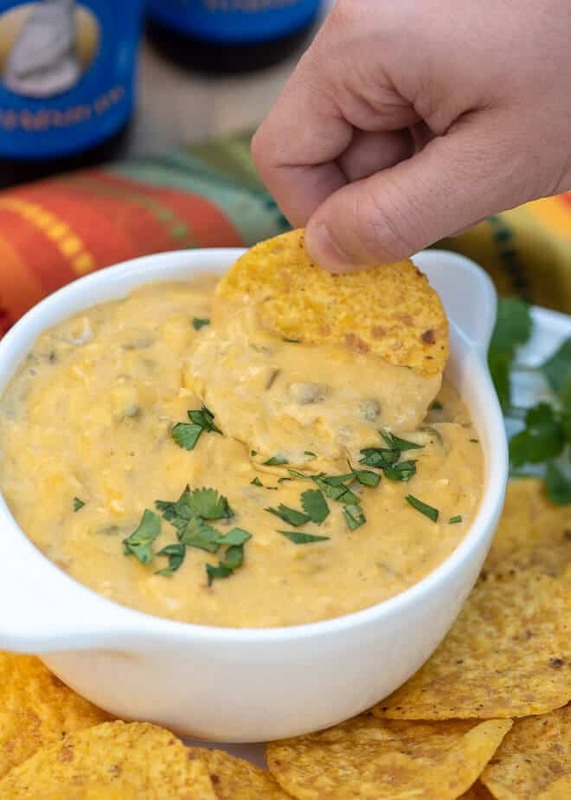 This Slow Cooker Green Chile Chicken Queso is game day party perfection. Get it started in your slow cooker before your guests arrive and it will be melted and ready to serve by game time. Also sometimes referred to as Super Bowl Sunday. I may not be much of a football fan but I do love the spectacle of it all and it is the BIG game so even for non-football fans like me, it’s fun to take sides and get involved. Then there’s always the food. 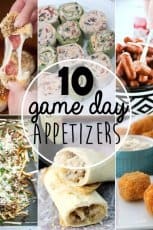 Hallelujah for football food! 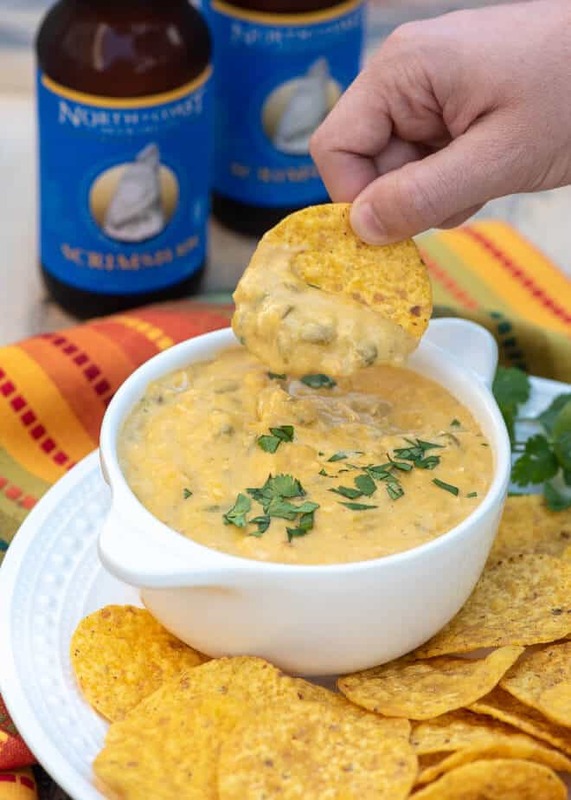 As far as I’m concerned, it’s not Super Bowl Sunday without a cheesy dip. 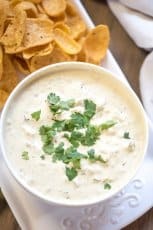 I love that this Slow Cooker Queso can be started a couple of hours before guests arrive and it will be warm and wonderful for serving just as the game starts. Your slow cooker is your friend when entertaining. 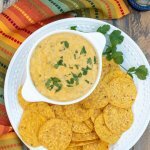 This queso consists of three kinds of cheese – the mandatory, non-negotiable Velveeta along with some sharp cheddar and Monterey Jack. Velveeta is a must for queso in my opinion. Nothing beats it in the “meltability” department and it does a good job of staying melted and combining with the other cheeses without separating. 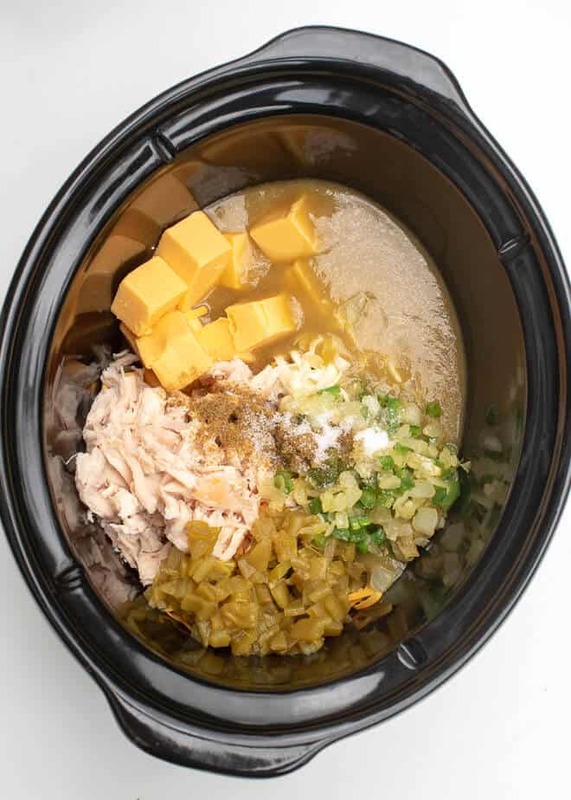 Quickly sauté some diced onion and jalapeno in a skillet and transfer it to a small slow cooker along with some chopped rotisserie chicken, a can of Hatch Green Chile Enchilada Sauce, a can of diced green chiles, a little cumin, and some salt. If you’ve visited this blog a time or two you may have noticed I love the line of versatile Hatch brand sauces. They can’t be beat. I’ve never worked with Hatch but have been a long-time lover of their products. If you haven’t tried my Green Chile Chicken Smothered Burritos yet, you just gotta. Trust me on this. 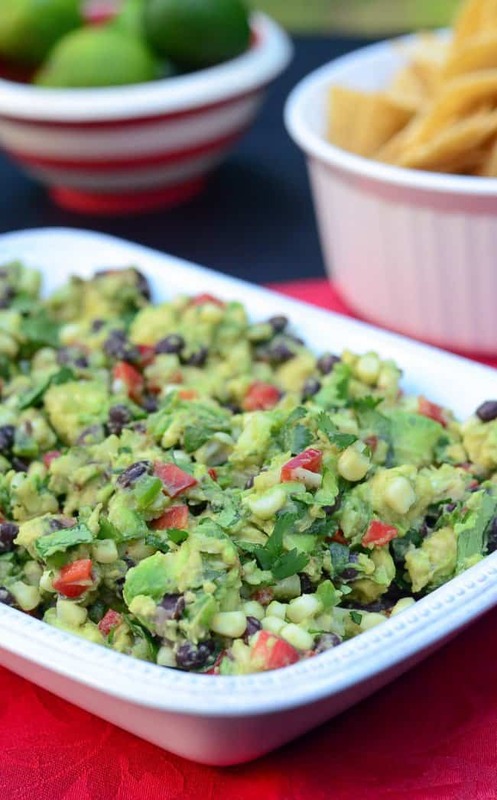 It will take you less than 10 minutes to get this recipe going. Then it’s just a matter of letting it cook on LOW until the mixture melts. I like to watch it closely and stir it once or twice during the cooking time and switch the slow cooker to the WARM setting just as soon as it’s completely melted. Transfer just what you need to a small serving dish and garnish it with a little cilantro for pretty presentation. The recipe will make about 4 cups which is plenty when you’ve got other snacks on your menu. If you have a large group coming, feel free to double the amounts shown on the recipe card below. I used my 4 quart Crock-Pot and it was more than big enough. If you are planning to double the recipe you can use a 4 to 6 quart slow cooker. If you end up with leftovers, which I highly doubt will happen unless you hide some (I’ve been known to do this), it reheats beautifully in the microwave. Leftovers are a wonderful thing. 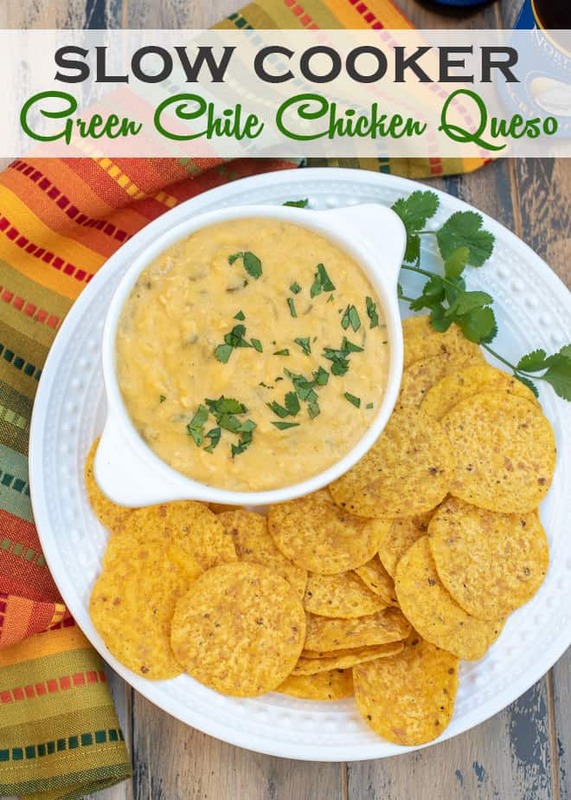 his Slow Cooker Green Chile Chicken Queso is game day party perfection. Get it started in your slow cooker before your guests arrive and it will be melted and ready to serve by game time. Add the olive oil to a skillet and place over MEDIUM heat. Add the onion and jalapeno and cook, stirring, for several minutes to soften. Remove from heat and set aside. 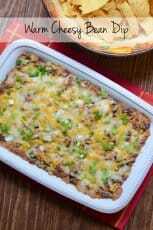 Add all of the cheese, green chile sauce, diced green chiles, rotisserie chicken, cumin, salt, and the onions and jalapenos from the skillet to a 4 to 6 quart slow cooker. 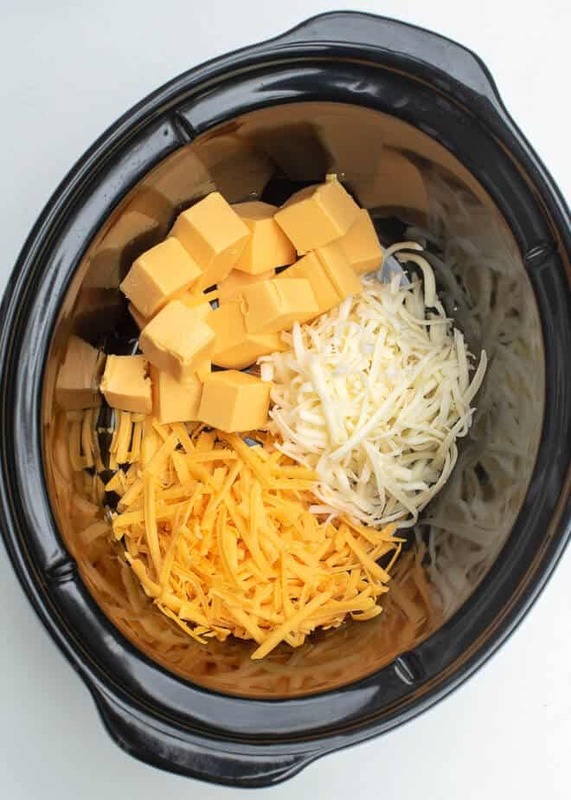 Stir well, cover, and cook for 1 1/2 to 2 hours on low, until the cheese is melted and smooth, stirring once about every 20 to 30 minutes during the cooking time. Set the slow cooker to the WARM setting. 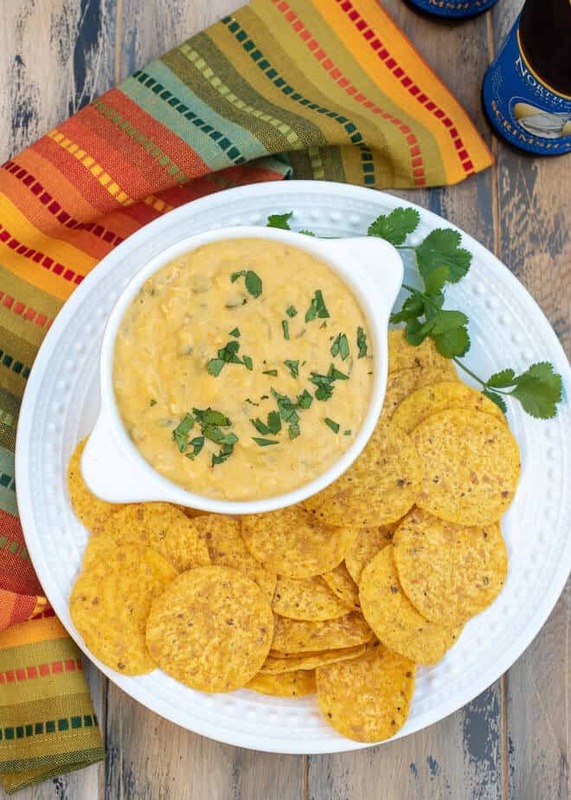 Transfer some of the queso to a serving bowl and garnish with cilantro and serve with tortilla chips. 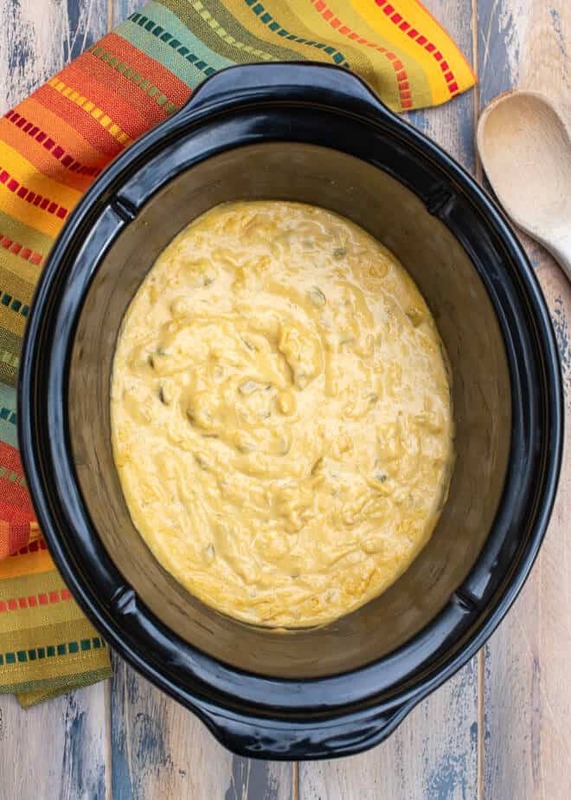 Any remaining queso can stay in the slow cooker on the KEEP WARM setting for an hour or two. Stir it occasionally to keep it the edges from burning.